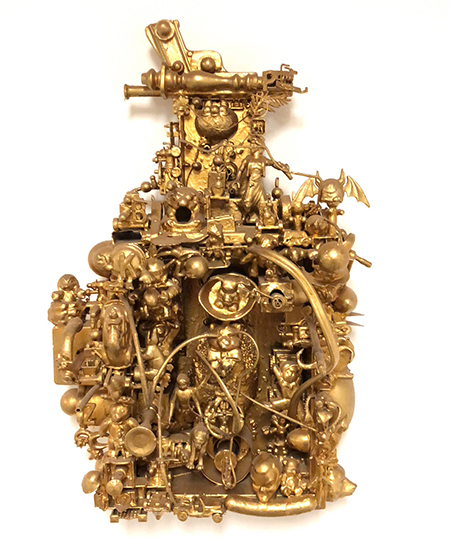 William Georgenes, "Roadkill Hoopdance," 2015, mixed media assemblage, 22 x 15 x 10"
From a distance, William Georgenes’s work looks like assemblages of scrap metal, sharp and unyielding. As you approach the pieces for further inspection, faces and forms begin to appear. They are familiar objects you may not have seen since your childhood, but are instantly recognizable. Ponies, toy soldiers, doll’s heads, and rubber finger puppets emerge from a tangle of monochromatic collage. Raised in a sanatorium as the result of his mother’s tuberculosis, the late Georgenes (1929-2017) had little education as a child. Yet his natural artistic ability led him to formal training at Yale University, and he later became an expert restorer of classical art. While his upbringing was bleak, his work is as humorous and playful as the man himself turned out to be. Each piece combines found objects, usually toys but also sometimes foliage-like objects and wire. Once the objects have been assembled, often in and around a cookie tin, they are coated in a layer of acrylic paint, and then given a metallic finish. By covering the objects in monochromatic pigment, Georgenes converts the nostalgic and familiar objects into aesthetic ones. We see a plastic spider as an example of form and shape. Barbie hair becomes an abstract mass of swirling lines. While Georgenes may claim his pieces are purely aesthetic, it is impossible to avoid seeing in them our own personal narratives. Georgenes said of his work, “[t]he more you look, the more you’ll see. And if you look too long, you get involved in them and you can’t get out.” Georgenes’s work certainly beg you to find each hidden face, each little object from our past. And once drawn in, you won’t want to get out.